Call UHL on 01246 451711. In-house power pack modification, upgrade, repair and refurbishment work undertaken in the UHL fully equipped workshop. 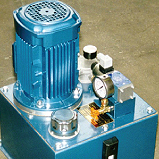 The trusted, reliable, quick quote, fast delivery range of standard hydraulic power units with very competitive pricing!. If the UHL standard range of hydraulic power units doesn't suit your specification ask us for a bespoke power pack design. UHL will fit and service all earthmover tyre handlers; no one knows our tyre handlers like UHL do! Send your ESCO or UHL Earthmover products in for a service or ask us for the spares you require. 1/4" to 1" 1 & 2 wire hydraulic hoses manufactured to order, other available on request including 700BAR rated hoses. Cross reference your valve or filter from one of UHL's competitive range of stock. Orders placed by 3pm for Hydraulic Component stock items are available for next day delivery. Timed AM services are also available. UHL Engineers are equipped to respond to your on-site breakdown and maintenance requirements, reducing downtime and saving money. What mail format would you like to receive your newsletter? 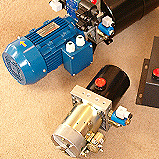 © Universal Hydraulics Ltd., 2013. All rights reserved.